Transposition is an inherent part of being a trumpet player. As orchestra members, we rarely play a piece that does not require us to transpose, either because we don’t own a trumpet in the specified key, or because we choose to play on a trumpet other than the one specified. The desire for a particular tone quality, better dynamic projection, more accessible high or low register, or even the opportunity to play in an easier key signature are some of the factors that we might use in determining which trumpet to use: B-flat, C, D, E-flat, cornet, flugelhorn or piccolo. 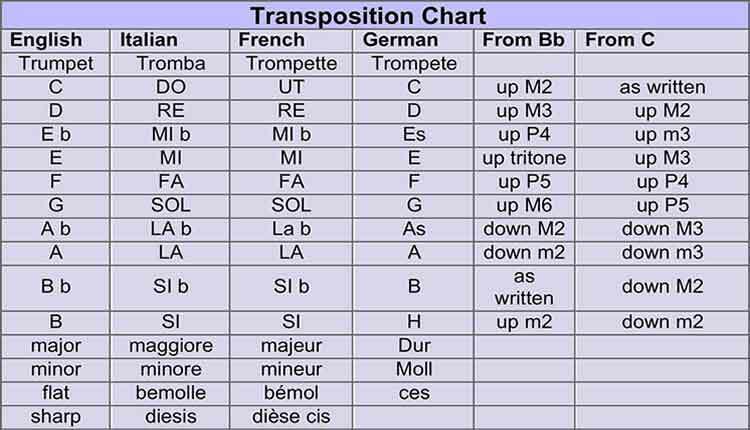 In the chart below are the transpositions encountered in orchestral music in the various languages, and the transposition intervals from either B-flat or C trumpets. On occasion (Shostakovich Sym. No. 1, for example,) the transposition to F-alta appears. The term alta means down to F instead of up. From B-flat trumpet the transposition is down a P4, from C trumpet down a P5. If a part is designated Cornet in G (German: Ventil-Kornett in G, French: Cornet-a-Pistons en Sol, Italian: Cornetto in Sol,) the transposition is down to G. That will be down a m3 from B-flat trumpet, or down a P4 from the C trumpet. Transpositions up a 3rd may be accomplished by reading the line as bass clef and applying the appropriate key signature (add 3 flats when transposing up a m3 and 4 sharps when transposing up a M3). Transpositions of up a P4 may be played as bass clef up a step and adding one flat to the key signature. Transpositions to trumpet in B, G and A-flat are extremely rare, so if you have limited time to practice transposition, focus on the others. Piccolo trumpet in A playing a part for D trumpet can be played by reading the line in bass clef, up one step, and adding one flat. Playing a part for C trumpet you can read bass clef and add 3 flats to the key signature. For piccolos, flutes and oboes in C: up a M2. For clarinets, bass clarinets, and tenor saxes in B-flat: play as written. For E-flat alto saxes, bari saxes, and E-flat clarinets: play up P4 (or as bass clef up a step, add 1 flat). For horn and English horn in F: play up a P5. For all bass clef instruments: play bass clef up a step, add one flat. Notice that if one can master the transposition of bass clef up a step, he or she can use that to transpose for the majority of the band instruments (E-flat clarinet, alto sax, bari sax, bassoon, trombone, euphonium, and tuba).